Not to knock any of the content, speakers, sessions, people I met, old friends I enjoyed seeing again, but I just have to say: thank-you VIDFEST for coming back to Granville Island this year. It’s one of the reasons why I think this conference is *extra* special. That, and the lack of the ocean of glowing blue bodies in the crowd from laptop monitor blasts and yes, more WOMEN! Fellas, wasn’t that nice? Lots of lovely ladies at VIDFEST. It’s a nice switch from the usual 10 to 20 per cent of the crowd that’s wearing a bra (or so I assume). Most shocking note: OMG – Impact Research spent what?! $150 THOUSAND dollars on a Facebook application campaign and got a mere 7,000 installs. Did I hear that right? Ouch. Most enjoyable: The locale, the sun and the zu crew, what little there was for visiting hours. Best new experience: Listening to Chris Anderson while watching him move around the stage in that slick, black suit. I do have to duck out of VIDFEST early this year – the festival is still happening as I write. But I have a Slumber Queen to catch and a 3-day music festival that is rivaled by very little. Sorry VIDFEST, Michael Stipe and The Cure win this time around. Follow the rounds of the festival over the last few days on twemes to get a snippet of all that shook down. I am quite certain there will be a decent amount of coverage on this year’s VIDFEST across the various channels. Starting with the mobile, check out cellmap for mapping out your whereabouts and getting VIDFEST right onto your cell. Moving into the internets (slash mobile to some extent), you can keep up with various bloggers and writers on the VIDFEST blog, or you’ll likely find VIDFEST coverage here here here here and here here here, and no doubt many others. I think you can still register… perhaps – even if it is just for one day or feature. I decided to do this Yoga Challenge thing. I bought a pass at Semperviva last fall for 3 months and really enjoyed my (mostly) daily practice (Cameron rocks). I signed up to be on their mailing list. I don’t particularly like mailing lists and avoid them at all costs, but I figured getting a peaceful reminder of what yoga has to offer me this month is a lovely item to have in my inbox every so often. I got one of their notes last week about a 40-day yoga challenge and I thought I could use a bit of that. I’m on day six and so far, so good. My body hasn’t magically transformed, not even a pinch, but I feel absolutely fantastic. I enjoy Yoga. I used to do more of it and have found myself wishing as of late that I did more of it – isn’t that always the way with the practices and exercises we all know will make us feel better in the end? That’s one reason for starting this Challenge thing: I want to do more. Or is it: I need more structure? I lived in LA 10 years ago for just shy of a year and practiced yoga almost every day (you kind of have to in order to survive that town). That was when I realized that taking an hour out each day is a really good thing. Then running became my daily meditation, and still is on some days. I am one of those people who loves running. The amazing shot of endorphins is one reason, getting in great shape is another, setting a goal and reaching it to run a marathon is another. But more than anything I think it is the structure I crave. It definitely feels good to have a daily physical regime. I think it’s important to take time out, even though I don’t do it nearly enough and I am guessing not a lot of people do. If you all do, please tell me your rhyme or reason in how you do it and how you keep up! It’s not enough for me to just say, “I’m going to exercise every day this week”. I need a goal and I need some form of routine and structure to get me there. Best part about this challenge: it’s ONLINE! These beautifully-sculpted lovely ladies give you a zen hour online – from grassy meadows, flowing rivers and mountain vistas in Wyoming. 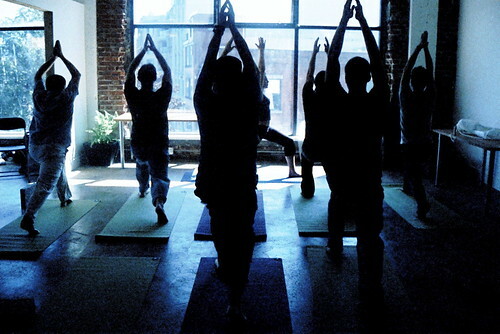 I enjoy yoga studios like the next gal, but I am really enjoying the online yoga at home. It equals structure for me and I guess that’s part of it too. So now that I am challenging myself (as are two of my pals: Go Kel! Go Glen! ), the challenge is out there to anyone and everyone. One hour a day, at your pace, in your own time, online, all for you. Most conferences I attend or participate in, or co-produce for that matter, tend to lean a tad more toward the “geeky” type of affairs as opposed to the more creative. Working in social media and technology for the past several years, this fact is just par for the course and happens to be the kind of event I enjoy, much to my own surprise and even though some of the time those uber geeky topics and conversations are over my head. It is these conferences that have helped in convincing the rest of the world that being geeky is in style and they have assisted in bringing the affectionate term “cool geek” into the mainstream. I definitely don’t rank in the cool geek stardom status. I can write *some* code and I built an entire Flash website from scratch, once. I was the art student who wished her ways of straight-A’s in math didn’t up and vanish from the left brain after Math 12. I love technology and everything fabulously geeky about it. I dream about better applications and how I could implement them, but I can’t build them. I think what I love most about technology is how creative it can be. I think that’s why I’m still here. What does any of this mean and where might you fall? Are you a geeky artist? Or an artsy geek? 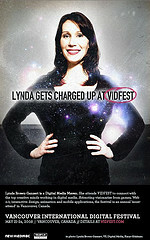 VIDFEST is the perfect answer for the creative geek and techy artist in you. This year will be my third consecutive year at VIDFEST and it’s one of my favourite conferences for this reason. It tends not to focus so much on the business of technology or creative content, but more on creative content and contribution itself – how creativity advances technology and how technology inspires us all to think creatively. It fuels my definition of inspiring. It’s the perfect equation, if you will, of techy and creative, where geek meets artist. If you’re visiting the VIDFEST site in these last few days and hours before things kick off, wondering if you should attend, you should, no matter what side of the brain is urging you to. The official program alone is reason enough. But if it’s not, speaking from an artsy-geekish perspective: You will meet great people, you will have memorable connections, you will have fun, you will be inspired.